The foundation of a dry rub is its salt and sugar ratio. A meat like beef might not need any sugar at all, while pork can benefit from a 50/50 ratio of salt and sugar. Likewise, game and fish prefer higher proportions of salt. Either way, have the kind of meat in mind that you will be using the rub on to decide your proportions. You can then figure out what kind of salt and sugar will best complement the meat. Differences between salts can be quite subtle, but a world of bold, diverse sugars is out there waiting to be explored. These myriad sources of sweetness can add their own distinct signature. Together, the salt and sugar should amount to about 50% of the weight of the rub. The next step is to select a pepper, whether that is black, white, pink, green, or a light cayenne pepper. Try to get your hands on some fresh peppercorns and grind them to get the most flavor out of this element, but use a light hand to avoid overwhelming the rest of the rub. The next components are the transition spices, which are used to bring together the salt, sugar and pepper. Transition spices tend to be savory and pungent, such as onion powder, cumin, paprika, more distinct chile powders, or mustard. Finally, the signature flavors are herbs and other lighter flavors that really make your mark. Think about traditional meat and spice/herb pairings as you select your signature elements. 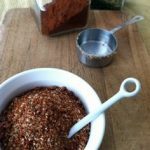 The combination of pepper, transition spices and signature flavors contribute the other 50% of the rub. A few tips can also help you take your rub from decent to excellent. First off, keep freshness in mind. Spices lose their flavor over time, especially after being ground, so try to refresh your spice rack annually. Keep in mind that taste tests are essential! Taste the rub as you build each element, and once you are satisfied, move to the next component. Add each piece one at a time, so that your taste buds can understand the rub each step of the way. If you think of the rub like a science experiment, you’ll know exactly how each piece affects the whole. Remember that the basic building blocks of a rub are often more important to the final result than the tiny additions at the end, so pay particular attention to the salt, sugar and pepper. You can even think about blending together different types salts, sugars and peppers for added complexity. Need more inspiration? Try stopping by your local ethnic food market to look for exotic ingredients, spices, and herbs. There are a number of sugars that offer a chance to explore depth, such as palm sugar from Southeast Asia or chancaça from Brazil. Think about local specialties in your area and try to incorporate those influences. Alternatively, look at the ingredients list on your favorite novelty beer and work its flavors into your dry rub.